Russia is entering the final testing phase of its nuclear-armed intercontinental ballistic missile dubbed Satan-2, President Vladimir Putin said Thursday. Russia announced plans in 2013 to develop the ICBM to replace a Cold War standby known in the West as “Satan,” or the RS-20B Voyevoda in Russia. Putin unveiled Satan-2 with an array of other nuclear-capable weapons at his annual speech to both chambers of parliament in March 2018. 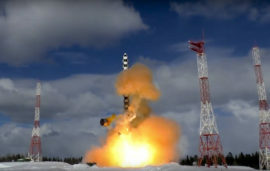 “The final tests of the missile Sarmat are proceeding successfully,” Putin told senior officers and prosecutors, the state-run TASS news agency reported. Satan-2, or RS-28 Sarmat, weighs over 100 metric tons and has a reported range of 10,000 kilometers. Moscow says the ICBM can get through the United States’ defense shield and is capable of destroying an area the size of Texas. The RS-28 Sarmat is equipped with multiple hypersonic warhead MIRVs to help it evade missile defense systems. The Russian government says the new missile can carry a payload of up to 15 warheads. TASS previously reported that flight development tests were planned at Plesetsk testing ground in western Russia between April and June 2019. Trials are thought to end in 2020, an unnamed Russian defense industry source told the news agency at the time.